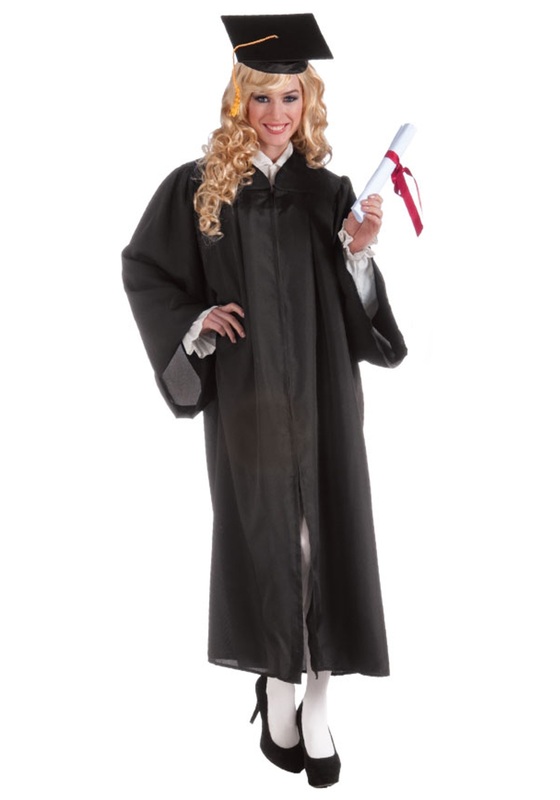 Take the prideful walk to grab your diploma in style when you wear this Adult Black Graduation Robe. This robe is great for celebrating any kind of graduation. Look the part; you deserve it! Or maybe you just bought the robe and you didn't really make the necessary grades to get it, but that's ok, your ingenuity means you deserve it just as much as the guy who sat next to you in chemistry class and got all As. Why go through all of the work needed to get to walk at graduation when you can just get yourself the same robe in just a few minutes. No long days and nights studying or teachers hassling you - just a great robe at a great price. This 100% black polyester robe has long, wide sleeves for that classic oversize look. The robe is roomy and fits chest sizes up to 42". Add a graduation cap and a pair of black shoes to complete the look. It will be ready to walk across a stage or to jazz up any Halloween costume this season. It will give any look a regal feel to it!